Great Deals on 4x4 Hire at Thrifty Car Rental UK Moving house? There are great deals on at Thrifty Car Rental UK for car and van rentals. So whether you're packing your bags or boxing up your house, you're bound to find the deal for you! Up to 30% Off Pre-Bookings Plus an Extra 5% Off Vehicle Hire at Thrifty Car Rental UK With up to 30% off pre-bookings, it is perfect time to book with Thrifty Car Rental UK. London to Birmingham Car Hire from £63 at Thrifty Car Rental UK Want some convenience? Take advantage and rent a car from Thrifty Car Rental UK. 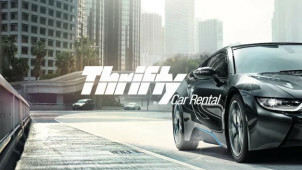 Up to 30% Off Pay on Arrival with Pre-Bookings at Thrifty UK Car Rental UK Make sure you take advantage of this amazing discount at Thrifty UK Car Rental UK. London to Barnsley Car Hire Bookings from £48 at Thrifty Car Rental UK Prefer a peaceful journey? Why not hire a car at Thrifty Car Rental. 10% Off 2nd Car Hire Booking at Thrifty Car Rental UK Enjoy double the driving with 10% off 2nd car hire bookings at Thrifty Car Rental UK. With tens of thousands of cars on roads the whole world over, Thrifty have established themselves as one of the premier names in car rentals. Offering a range of flexible and affordable services, with convenient pick-up locations at both airports and central city areas, Thrifty offer you the chance to drive away with a great deal. They have a number of options to best suit your needs, from daily hire to long-term rentals, with car and van leasing also available. Whether you need a family saloon, a people carrier, a 4x4, something cheap and cheerful or something flash from their ‘elite’ range, get all the fun and freedom of the open road with great value car hire from Thrifty. With these amazing prices, you can afford to explore your destination in comfort and style. Whether your holiday is getting you closer to the great outdoors, or you just need something to eat up the miles between cities, Thrifty Car Rental has almost six decades of experience, so let them take the wheel. How do I use my Thrifty promo code? Have a look at Thrifty’s great value ‘flexifleet’ options. What ID will I need to be able to rent with Thrifty? You will need to bring along your payment card, your driving license and 2 additional forms of ID to confirm home address, which can include bank statements and utility bills. If your license is an old paper license, you will need to bring an additional form of photo ID. Do Thrifty cars come with a full tank of fuel? Thrifty cars are provided with a full tank of fuel, and must be returned with a full tank. Do Thrifty have an age limit for renters? Drivers must be at least 25 years of age, and must have held a valid driver’s license for at least 1 year prior to renting. How are Thrifty Car Rental rates calculated? All rental rates are based on a 24-hour day starting with the hour that you pick up your vehicle. Phonelines are open from 7:00 to 22:00 daily. With almost 60 years on the road, Thrifty Car Rental has become one of the biggest car rental companies on the planet, with more than 1000 locations worldwide across nearly 80 countries. When you’re on holiday, nothing beats the freedom and flexibility of having your own car, so use a Thrifty promo code today to get the wheels in motion. With our great range of deals on Thrifty rentals, we can get you on the road without breaking the bank. With 99 locations across the UK alone, with everywhere from Inverness, to Ipswich, to the Isle of Man, Thrifty has become one of the most recognisable names in car hire the world over, and have expanded to include dozens of countries across the globe. Wherever you need a car, whether it’s in France, the US, or Azerbaijan, Thrifty’s got the right deal to get you on the road. With a number of options including sports cars, saloons, vans and hatchbacks, you can find the right vehicle for you with Thrifty. Treat yourself to a spin in the glamorous Jaguar F-Type R V8 Coupe, a slick, powerful sportscar guaranteed to turn heads. With a Thrifty discount code, you can travel in superstar style without the hefty price-tag you’d expect. With Jaguar’s Adaptive Dynamics, this beast can go from 0 to 60 in under 4 seconds, and handles perfectly in any road conditions, from the Highlands, to the Alps to the Autobahn. Grab a great deal today on this incredible machine with vouchercloud and Thrifty.